We are here for the week. Zoe has worked very hard this term with her G.C.S.E’s; Irene’s worked superlatively hard in Year 7, far beyond the call of duty. Her work is mainly projects, and she produces little well-researched books on each of them. Roy worked hard clearing much of a back-log of years of procrastinated family, personal and business projects, and I over-blogged. So we thought a week away would renew our energy and zest for the next 6 week term. “A change is as good as a rest” is one of my life-mottoes. I really believe it. It refreshes and enlarges one’s perspective as much as a beach holiday would do. We’ve mainly come here for Renaissance art and architecture, but will see some stuff from the ancient world, of course. So today, the Pantheon. An amazing dome, even though the bronze covering it was looted by the Byzantine emperor, and taken to Constantinople, and the interior bronze was looted, a 1000 years later by the Pope. That lovely eye is called the oculus, and it sends an eerie shaft of sunlight into the building. Just behind the Pantheon was the church of Santa Maria sopra Minerva, Rome’s only Gothic church, and one of the most beautiful and enchanting churches I’ve ever seen. 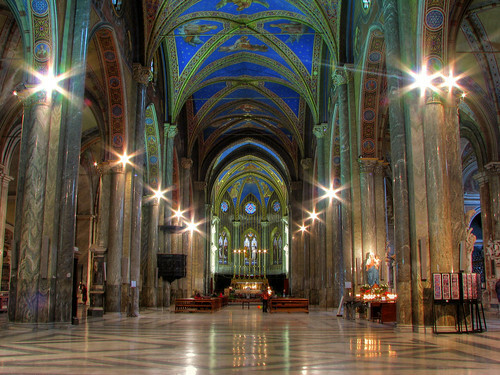 The ceiling was what is called a Giotto blue, with gold stars, and lavish paintings. It was like fairyland, like an enchanted world, like Paradise. Isn’t it lovely? Unfortunately, I made a basic travel error, and packed on preconceptions rather than weather forecasts. Rome, hot, right? Wrong! And so I am fighting a monster cold. Prayers for health will be gratefully received. We really enjoy travelling in Mediterranean countries. Italians, Spaniards and Greeks seem to me like Indians–with lighter skin. Voluble, excitable, loud, gregarious, fun-loving. My French tutor, who is a real Parisian intellectual, actor and director, and playwright who has adapted novels for the stage told me he would never go to Italy. Why? Because the manners of the Italians who come to Paris are “tres mauvaise.” Why? They talk so loudly? Is that necessarily bad-mannered, I ask shame-facedly. (Our family gets involved in animated discussions and arguments, which, yes, get loud wherever we are!) It is impolite, he says primly. Have you been to Rome before? he asks. (Our rule is French only, and I am sure our hour of conversation amuses him). “Yes, 25 years ago.” “Oh, it must have changed a lot,” he says. But Rome is the eternal city, and the Pantheon has not changed. Neither I hope has the Vatican,which we will visit tomorrow, if I can shake off this monster cold. Thanks Penny. No better, but have decided to see the American Episcopal church, St Paul's within the Walls with mosaics by Burne-Jones, and designs by Morris. Should be less crowded there. How lovely – and perhaps there is a beautiful, warm Italian shawl just waiting for you to wrap around yourself as you sightsee. Hope you feel better and can enjoy the holiday.